EWS GmbH & Co. KG / pv.de | LG Solar Autumn-Special: Get a cashback of up to 200 € for your order! 11.10.2018 - LG Solar Autumn-Special: Get a cashback of up to 200 € for your order! 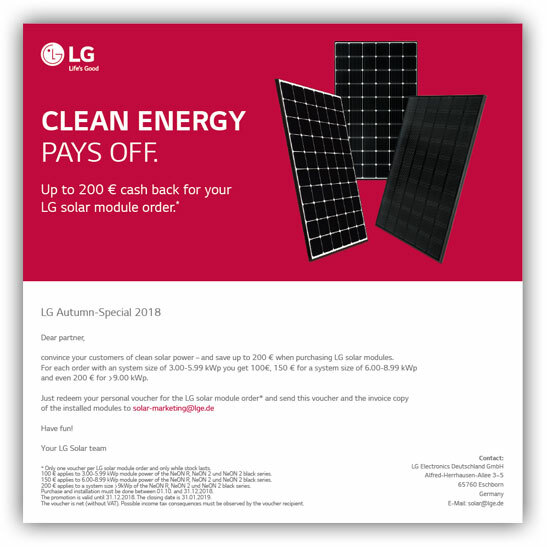 Our module partner LG Solar has launched a new sales promotion, the LG Solar Autumn-Special. Save up to 200 € per order until 31 December 2018. At the heart of the campaign are the monocrystalline NeON R, NeON 2, and NeON 2 Black solar panels. These innovative and reliable series combine high performance and aesthetic design. True to the campaign’s slogan “Clean Energy Pays Off”, you and your customers will therefore benefit twice in the promotion period. Send an invoic e copy and the below voucher to solar-marketing@lge.de until 31 January 2019 at the latest. Download: Voucher Autumn-Special 2018 "Modules"
Purchase and installation must be done in the promotion period. The closing date for the required documents is 31 January 2019. Only one voucher per LG solar module order and only while stocks last. For more information on the promotion products, please have a look at the LG Solar website. Your purchase conditions can be found in our QuickCalc calculation tool which is available in the EWS Partner Login. Best of luck with the LG Solar Autumn-Special!